Before writing this blog, I came from my studio and noticed some broken pieces of industrial rubber sitting by the curb. Hardened from weathering and worn by vehicles driving over them, the crackled black surface retained a striking yellow streak. To most, their presence would go unnoticed, but to me, as a ceramic artist, they possessed a visual potential that I instinctively knew could lead to a new series of works. It may seem obvious to say that observation is an invaluable part of an artist’s practice, but for me, it’s a research method and form of image collection that I have developed over the years – from drawing and painting in sketchbooks and making cardboard maquettes to forming slabs in clay. Observation has become as integral to my process as making and firing, and without the ability to observe and record my surroundings I think my work would be very different. I like the notion that from a small mark on a wall, a spray-painted number on a paving slab, a rusted sheet of corrugated metal or broken piece of rubber, it is possible to see beyond ideas of unsightly detritus and reinterpret those markings or objects through the creative process. I’ve been working with clay for the past 20 years. For me, clay is a material that’s always challenging, yet ideal for creating the forms I wish to make. It can be unpredictable, and hard work, but ultimately rewarding and gives me scope to define my interest in the relationship between industry and nature. Working with clay also means working with a specific series of tools: a kiln, cutting and rolling equipment, slips, oxides and glazes are all vital to the physical process of ceramics, but something that’s invaluable to me and an integral part of my own creative process, is the ability to observe the world around me and to translate these observations into clay. Rebecca Appleby | Urban Palimpsest is on show at New Craftsman from 10 September to 8 October alongside Matthew Lanyon | In The Tracks of the Yellow Dog, with sculpture by Breon O’Casey and ceramics by Matthew Chambers. I titled this exhibition ‘Home Museum’. I am not talking about a grand ‘art’, rather I am talking about something that has come from the rawness of hand and material, the survival of objects that went through extreme heat, and what that reveals about the making process and my everyday life. It is my 3D sketchbook. This new collection is directly related to my recent booklist. I was a psychology student 20 odd years ago and I have been reading a lot about the human brain lately. ‘The Brain That Changes Itself’ by Norman Doidge triggered my interest and led me to other related books in psychology, sociology, biology, neuroscience and religion, written from the view of brain function. Surprisingly there are many books in this area that can be understood without specialist knowledge, and can be easily related to our daily lives. I went to see some Impressionist paintings recently, described in the exhibition guide as ‘unfinished’ in comparison to conventional descriptive paintings, and therefore not taken as ‘proper’ painting at the beginning of this art movement. In the world of craft, it was not the creators of art work, but connoisseurs who found beauty in the unpolished, peasant craft work of Japan. These pieces were called ‘gete-mino’ (the translation from Japanese to English is ‘grotesque’ or ‘badly made things’) and were supposedly second class artifacts. Soetsu Yanagi, the founder of the Mingei movement, rebranded it as Mingei folk art, since the phrase ‘gete-mino’ had negative connotations. Akiko Hirai | Home Museum is on show at New Craftsman from 28 May to 2 July. 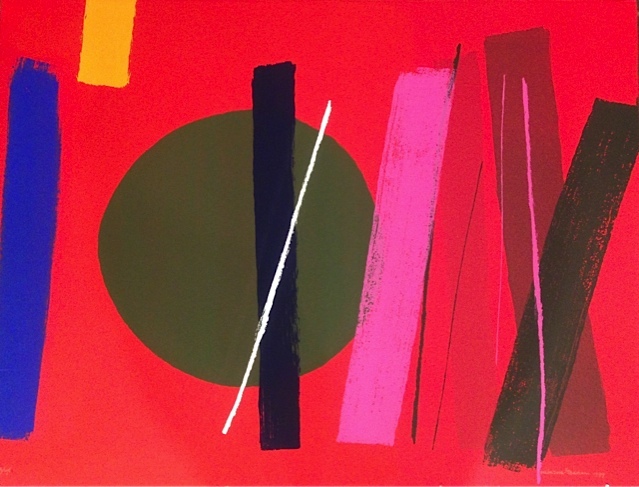 Paintings and prints by Lieke Ritman and screenprints of the work of Lucie Bray accompany the show. Landscape has always been an abiding theme in the arts, in painting most obviously, but in today’s art world previously divergent ideas and disciplines now merge with increasing confidence in the making of new works. This month artist Adam Buick, on show as part of our spring exhibition, brings ceramics and landscape together in a ‘Cornish Series’ of spellbindingly lovely pieces which demonstrate this disconcerting mix of subject and medium. 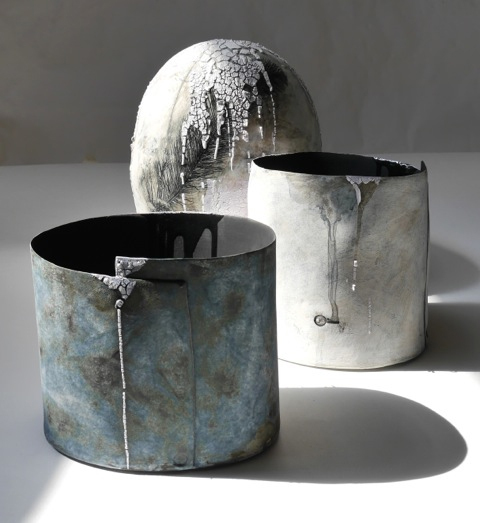 Exploring ideas around the resource heritage of Cornwall’s rich landscape, his works incorporate minerals, rocks and clay from the Cornish countryside using ‘a single pure jar form as a canvas to map my observations’. Reflecting both visual and tactile ideas of ‘place’, Buick’s work is strongly embedded in the subjective study of landscape and for this exhibition each piece draws upon the geological drama of West Cornwall and St.Ives. In his large scale Moonjars, sheer weight combines with endless spherical surface and dark inner depth to evoke the sure and boundless breadth of the Cornish landscape. They are reassuringly strong and peaceful, like the earth beneath our feet, like a moment alone and at one with the great outdoors. By contrast, his elegant miniature works, held roundly in the palm of your hand, evoke the light solidity of a beach pebble, the playful weight of a skimming stone, in colours and textures that speak of shifting, prettily patterned sand, of grit and ore and the clean cut of industry through solid rock. Each a self-contained experience of landscape on multiple levels, as a collection they tell the story of Cornwall at its very core. As part of Curious Things, our Christmas show of contemporary craft curiosities, woodworker Richard Keal, felt worker Barbara Keal and automata artist Jack Stiling discuss their respective ways of making and share thoughts about their work. Richard: One of the things we all have in common is our use of recycled materials. Jack, where do you source your materials? Jack: All over the place, it depends on where I am. My latest work uses up parts I’ve collected over a few years from junk shops, skips, hedges and antiques places. My workshop had a few piles of stuff outside it from a friends hoarding habit, so I did him a favour. But there’s a subtle science to it – getting the ‘right’ rubbish. Older objects generally have more interesting and better made parts, whist with new tech I’m only able to get a handful of usable bits. Do you two find your ideas change in relation to the materials you have at the time? I’m subject to that quite a lot. Richard: I have a stash of logs myself, of all different shapes and sizes, with different twists and ‘nobbly nirks’. Sometimes, as one bit of log sits well on another bit of log, I find ideas grow organically. Barbara: My felt work has become more like this of late too. In the case of the Hebredian Bison you can see how that fleece was perfect for the job, but I’m also interested in associations and memories held by certain materials: the grasses of a particular summer in a particular place, a bit of horse hair caught on a fence or the feather of a dead crow. I loved pondering the history of the limbs of “The Doll Jack built”. Jack, do you think about potential associations when choosing which parts to use? Jack: I find the history of each piece quite fascinating, and being able to list what each bit is, and how I got them, is a great conversation starter. When I’m making things it’s a balance between groups of objects that work well together visually, and also which parts magically fit together in a mechanism. Eureka moments, like finding out a bit of a lawnmower fits exactly to a cog from a shredder, are priceless. The Craftsman is all about that: it being made of everything that was surrounding me at that time is the embodiment of this profession in a way. Sometimes it can be a massive pain using only found objects though. Recently, for complex things I’ve been making mechanisms from scratch out of stock steel, and brazing it all, which is a life saver. And I’ve got some random, exceptionally pleasing bits which I just can’t bring myself to use, for ridiculous sentimental reasons. Do you get some materials that you just become too attached to? Barbara: Not a very sentimental chap Rich. At least he would never allow himself to be. I don’t really get attached to fleece but I can do with other stuff. I have a single feather which fell from a crow with a broken wing whilst it was in our kitchen. I took the crow to the vet who to my great sadness put the bird down. I felt terrible because I’d soothingly told the frightened creature that I was taking it to find help, talking and humming to it all down the road held tight in my hands. It was an unintended betrayal. I kept thinking I should have taken it in as my pet, paid for it to be treated and let it live in our back yard , but perhaps it was true when the vet said afterwards there was no other option. So that feather is precious and will need to become part of a piece that I will keep, I think. There are definitely finished pieces that I find hard to part with. I made a pot once whilst driving round the country in a van, pregnant with Abednego. I would add a few coils each night and keep it wet, and later used it as a singing vessel in a performance. Then I sold it. Now I hate the thought of that pot’s history being unknown as it sits doing nothing somewhere in America. Letting go makes space for new things to be made, though. Does your workshop feel empty now, without those big pieces from our show? Jack: Actually it’s a great feeling having all my space back again; a fresh slate and room for a new set of ideas. I spend so long working out my projects that I’m thinking about the next project pretty soon after I start the making process. I like to go through stages of creating different things to keep my ideas fresh, so I’m thinking about doing more performance orientated work next, collaborating with puppeteers or street performers. Have you ever thought about putting your work and skills into a new area? Richard: For some time now I have felt that making things was mostly ‘for the maker’, meaning that we are the ones who stand to gain the most from our activities. It’s a sort of freedom that doesn’t happen in any other way. Of course one can share this freedom by experiencing other people’s creations and being inspired to see the world around them in a different way, but I think it’s through the act of making that one works with the world and it’s materials in a less than totally conscious way. This is what I consider the most fruitful aspect of creating objects. So yes, I have been thinking for a while about working with other people and their ideas – people that maybe find it difficult to express themselves freely because of the narrow value system of our society – helping them to create works or to simply play freely. Jack: What I aim to do is revive the innate imagination we get distracted from in modern society, and as time goes on. The pieces I put on display were made for as broad an audience as possible, and aim to dispel preconceptions of a gallery being a solely commercial place. Automata is a good way to round up a lot of interests, materials and disciplines. Throughout the process of making, as well as from a finished piece, I get a brilliantly diverse range of people talking to me about all kinds of aspects of my work, some of which I hadn’t even seen myself. This, for me, is when the work fulfils its purpose. That makes selling it irrelevant and a bit ironic considering my values! I agree with you Rich, I think that being an artist can be a selfish endeavour, but one of the main focuses for me is allowing people to see alternative perspectives. Making things and understanding them first-hand has always been more valuable to me than relying on technology to do it for me, and I want to open up more people to that way of thinking. Curious Things is on show at New Craftsman from 5 December to 8 January. This October our Colin Orchard exhibition, which celebrates the artist’s 80th birthday, is a masterclass in compositional punch. And that’s no surprise: Colin spent much of his career as a layout artist for The Times newspaper, and was later Art Director for Letraset International, so clarity of composition and slick, suspenseful use of space are in his creative DNA. Colin will also tell you that he has a preference for square format works, since the purity of the square maximises compositional power. In his work, less is more – so much more – than you will see in the work of his contemporaries. Subject, which in this collection includes landscapes and scenes of women in studio interiors, is irrelevant to compositional considerations. Composition is an art form all of its own. But what if your artwork area is not as large, your format not as flexible as the endless range of dimensions afforded by canvas? What if exquisite detail and fine craftsmanship need to be contained within the edges of a tiny box? Or in a piece small enough to pin to your lapel? Alongside Colin’s work this month, you can see a towering talent for miniature composition in the beautiful work of jeweller and metalsmith Cornelius Jakob Van Dop. Each of Van Dop’s works is small enough to fit into the palm of your hand, yet within every piece you will see a perfect balance of space and subject. Each of his works, either by way of detail or, in the case of his single entity brooches, by omission, tells a story of wild nature, moonlit nights and our countryside’s rich abundance of small creatures. 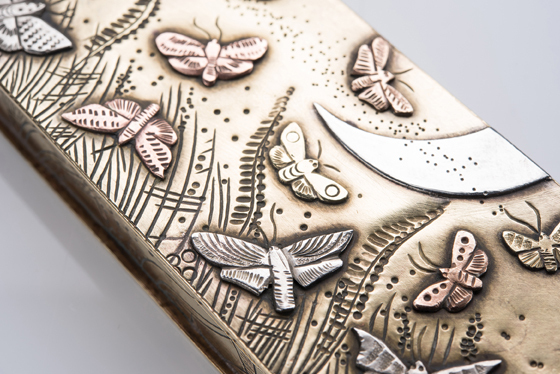 Bee and butterfly brooches rest lightly in perfect equilibrium, and boxes detailed with wide fields full of summer flowers and buzzing insects are as focused and composed as any painting. 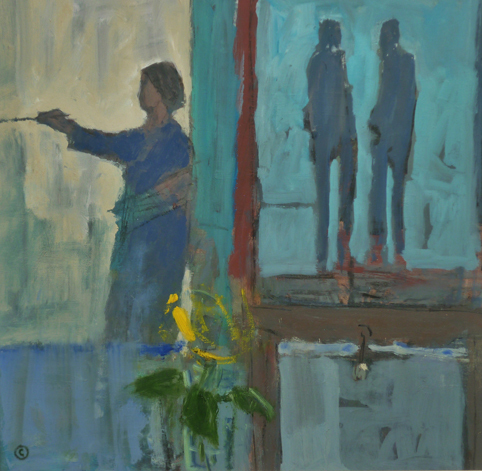 Colin Orchard at 80, with Cornelius Jakob Van Dop is on show from 10th to 31st October. Place is latitudinal and longitudinal within the map of a person’s life. It is temporal and spatial, personal and political. 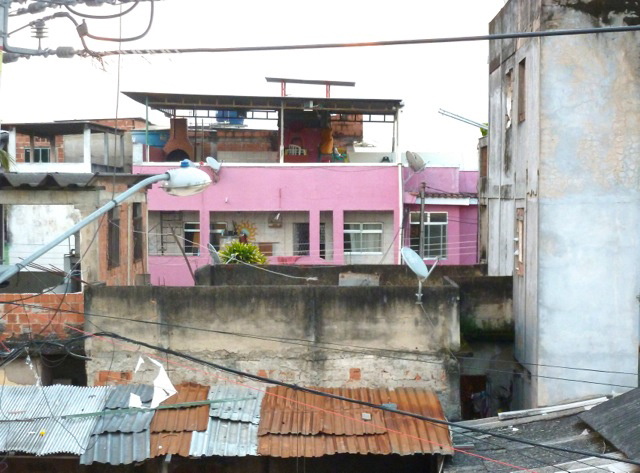 A layered location replete with human histories and memories, place has width as well as depth. It’s about emotions, what surrounds it, what formed it, what happened there, what will happen there. Lucy Lippard, Lure of the Local; A Sense of Place. My life without galleries would be hard to imagine but as a curator I look for alternative spaces to engage an audience. With a background as a theatre practitioner I have a strong awareness of storytelling and narrative reflected in the way I approach exhibition making.I am interested in the ‘theatre of space’ as a site for creating interventions and encounters. These itinerant places can be a catalyst for the unexpected making of new connections and discoveries. The interaction of objects within a physical space creates a dialogue with the viewer and informs the interpretation of the work. A creative partnership with Irish potter Jack Doherty began with, A Place in the World 2012. 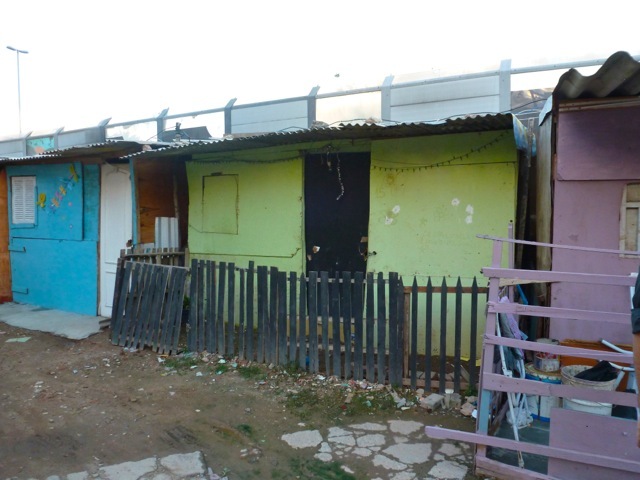 Here a house, also our home, provided an architectural framework and a domestic context to explore ideas around the social life of objects. Waypoint is our third project together and it has been a delight to work in collaboration with the New Craftsman St Ives to showcase a new body of soda-fired porcelain vessels to create an exhibition extending beyond the boundary of the gallery to connect with key historic sites in St Ives. Jack Doherty is the last in a generation of seafarers on the north coast of Ireland. He says; ‘My family were fishermen, sailors and boat-builders who made their livelihood in one way and another from the sea. I was to follow my own path. It is from this starting point that I made the work for ‘Waypoint’. The porcelain vessel forms have now become guardians of ideas and emotions, occupying domestic spaces in a different way. We see them in evocative places where they change with the darkness and light and connect with them in moments coloured by our own emotional state. They carry with them messages of everyday life and tell us powerful stories from places without word. 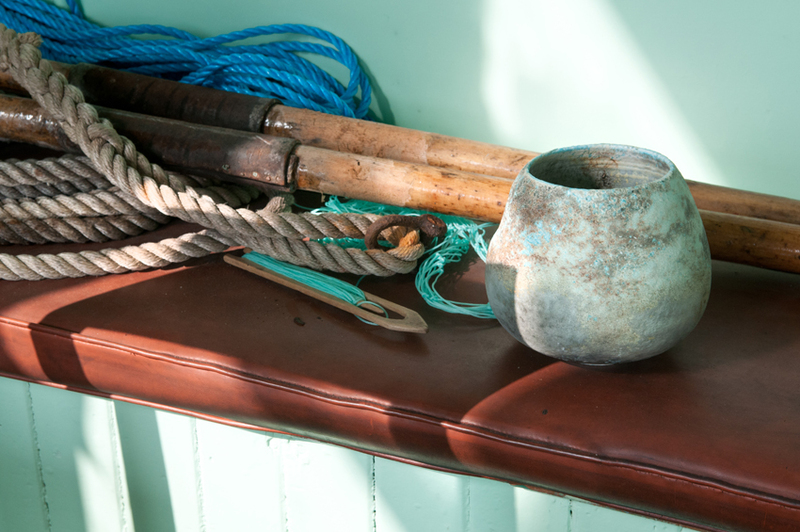 Connecting pots and people Waypoint marks a memory, time and place in a personal journey reflected in the history of a fishing community dominated by the sea. Waypoint is on show at New Craftsman from Saturday 5 September to 9 October, with site specific element on show throughout the St Ives September Festival from 12 to 25 September. A teenage boy with a beautiful, beaming face approached me. He had a board hung round his neck on which was a collection of earrings, none of them matching. 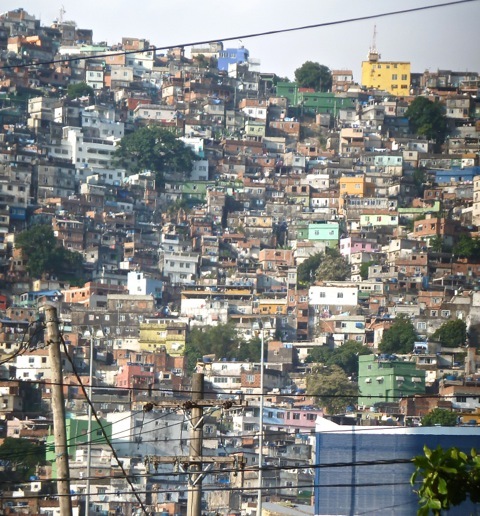 Each was made from found objects, which he sold to scrape together a living on the streets of Vidigal, one of the many favelas (shanty towns) that clings to a steep hillside in Rio de Janeiro, where life is tough and the cycle of poverty is hard to break. The feather earring I bought is the inspiration behind several vessels in my exhibition at The New Craftsman Gallery. 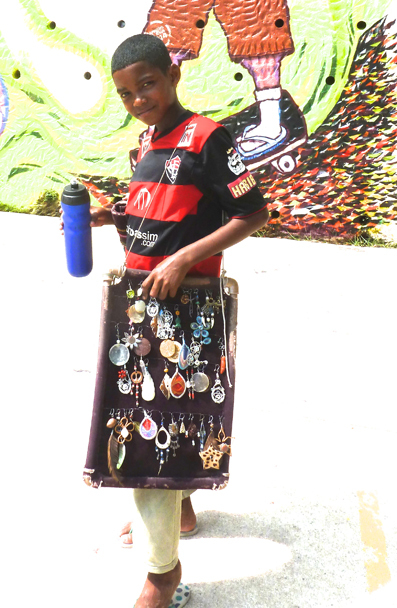 I met this boy whilst volunteering at the Street Child World Cup in Rio de Janeiro ( http://www.streetchildunited.org ) a charity that uses sport and art to change the lives of street children. This body of work comes from the heart. 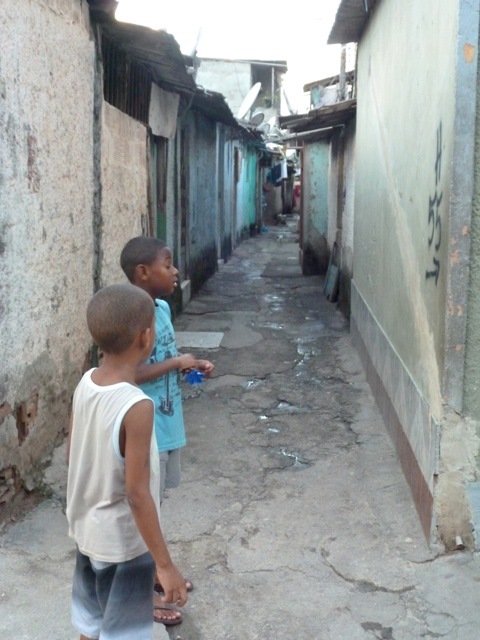 I returned from Rio very affected by my experience working with street children and I put this into my making. 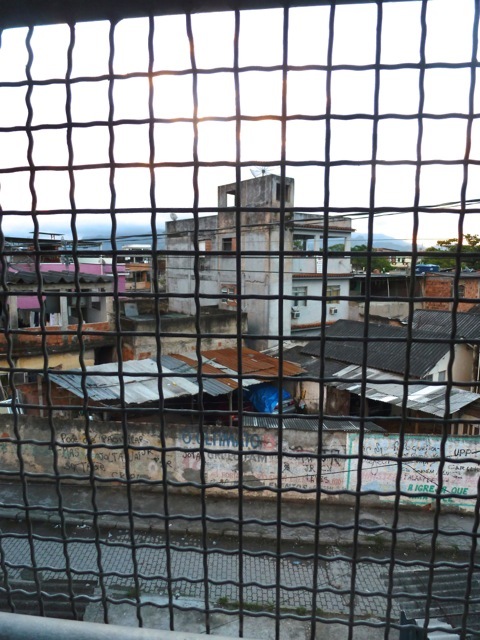 Each vessel tells a story and reflects the landscape of the favelas. I work from photographs and memory. The hand built abstracted forms began life as domestic vessels; pots, pans, jugs; symbolic of home; many show traces of broken handles. Fine rims and cracked glazes suggest fragility, and each is hand painted with many layers of slip, glaze, oxide and stain. See Hilary Mayo’s work at New Craftsman now and until 27th June. Sunday 8th March is International Women’s Day 2015, when thousands of events occur across the world to mark the social, political and economic achievements of women. This year’s theme is ‘Make It Happen’ and is aimed at encouraging action for advancing women’s opportunities. The idea is that different organisations celebrate within their own specific context, and as such we want to mention some of Cornwall’s leading women artists, whose work is celebrated as amongst the most influential in British art. It hardly needs saying that when you think of St Ives, you think of Barbara Hepworth, one of the world’s most important Modernists artists. Her sculpture garden is a stone’s throw from NCs door, and you can see castings of her sculptures Dual Form outside the Guildhall and Epidauros II up at the spectacular viewing area of The Malakoff. The studio of pioneering abstract painter Sandra Blow is also right here in St Ives, and West Cornwall can lay claim to being the inspiration and the home of so many more great women artists including landscape painter Margo Mackelburg, printmaker Wilhelmina Barns-Graham, colourist Margaret Mellis (who mentored the young Damien Hirst), sculptor Barbara Tribe and Newlyn School painters Dod Procter and Dame Laura Knight. Here at NC we are proud to show the work of St Ives Modernism’s leading women artists, and represent some of Cornwall and the UKs leading contemporary women painters, sculptors and craftspeople. Art-critical discourse rages on about the contribution of women artist, the ‘feminine’ in art and the ways in which history has written out the role of women artists in favour of their male counterparts, but whatever the debates, St Ives continues to cultivate a steady stream of powerfully important women artists. So – how can New Craftsman celebrate the artistic achievements of women? Watch this space for news of our 2016 exhibition of World Class Women artists past and present. As 2014 draws to a close here at New Craftsman and the New Year is upon us, we have fired up the Hotpod and are taking stock of a year of fantastic exhibitions. It’s been pretty peaceful along Fore Street in December, and now there is a rich purple light from the sweeping Atlantic sky that makes the sand of St Ives Bay glow and the rolling sea turn a vibrant aquamarine. In lots of ways it’s our favourite time of year, when West Cornwall is as dazzlingly colourful as it is in mid-summer, and the beaches and streets are empty and all our own. This time of year also inspires many of our best New Craftsman artists: in the paintings of NC favourite Neil Davies you can see the awesome energy of winter in Cornwall, with its ominous clouds, blinding shafts of light and wind battered heath land. Painter Emma Jeffryes’ sellout 2014 show was inspired by last winter’s powerful storms, a series of breathtaking weather events that gave a thrilling new feel to her work. It is a time to enjoy the calm, because before long we’ll start looking forward to the warmth and the hustle and bustle that comes with spring and the happy energy of St Ives’ many visitors. Keeping us company over the next few weeks is a beautiful exhibition of contemporary jewellery by Guy Royle, Breon O’Casey and Paul Preston, and a unique collection of one-off works by the Leach Pottery’s talented studio team. 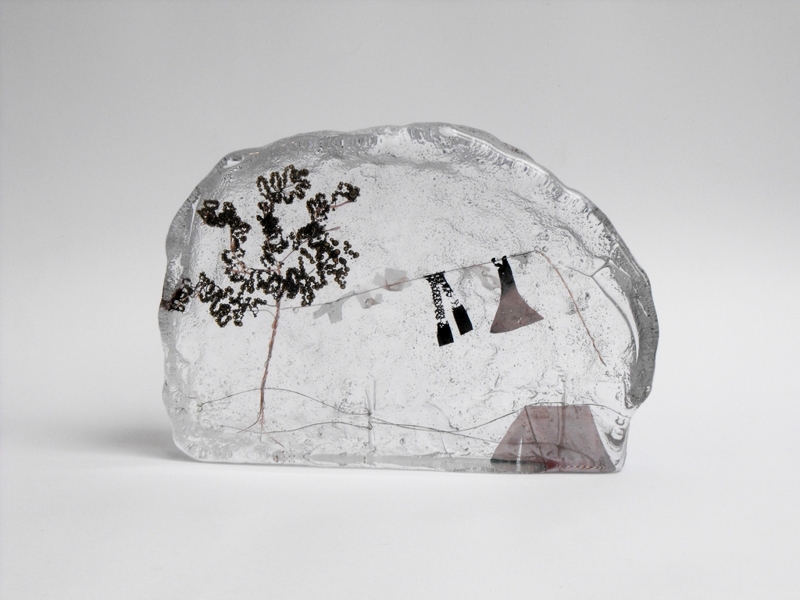 Most fitting for the season are Jenny Ayrton’s icey blocks of contemporary glass, with their precious scenes of homely domesticity, perfect for us as we cosy on down for New Year. Think craft. Think pottery. It’s a no brainer of course, but craft has come such a long way over the last hundred years. A quick glance at finger-on-the-pulse publications like Crafts Magazine demonstrates that the contemporary incarnation of craft now stretches to knitted clocks, automata, and elaborate polyamide vessels. And our culture is all the richer for it. But always, throughout the pages of every cutting edge magazine and on show at the world’s leading craft shows, ceramics – and pottery in particular – exudes an integrity that other crafts can only dream of. 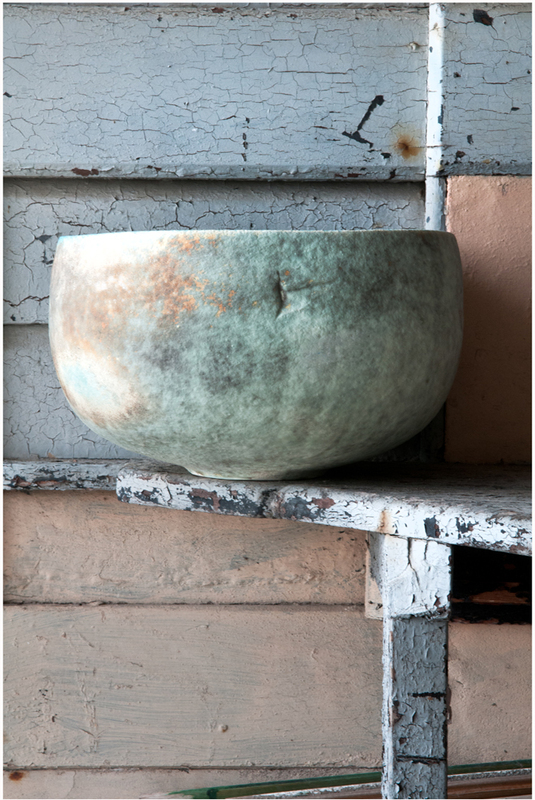 Here in St Ives we are lucky enough to have one of the most respected and influential studio potteries in the world. Over the last hundred years the Leach Pottery has forged the shape of studio pottery production in the UK and beyond, and today their newly restored studio, museum and gallery are continuing the development of Bernard Leach’s historic legacy, to the very great benefit of 21st Century British ceramics. The Leach Pottery has also played a key role in the history of our own gallery: New Craftsman was originally established by Janet Leach, wife of Bernard Leach, here at 24 Fore Street in 1962, and today these two historically important venues maintain a close working relationship. We are incredibly proud to remain the only St Ives centre stockists of the gorgeous new Leach Tableware, which continues to draw in the pottery faithful from across the world and is the catalyst for so many wonderful conversations with visitors to New Craftsman. We are also proud to be the main contributor to the Leach Pottery’s recent campaign to bring their historic fireplace back into use, alongside everyone who has pledged funds to relight the Leach fire and put the heart back into the old pottery workshop. 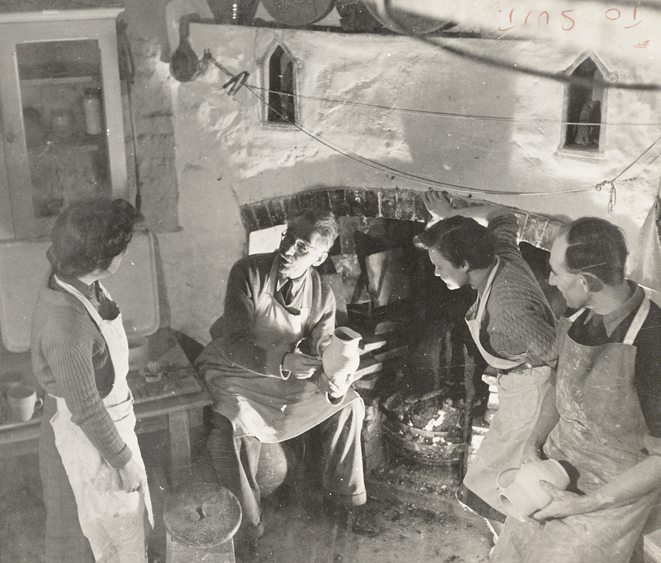 The fireplace, which appears in many old photographs, was where Bernard Leach would traditionally sit with his potters, students and apprentices each morning to share ‘crib’ and discuss the finer points of pottery making. 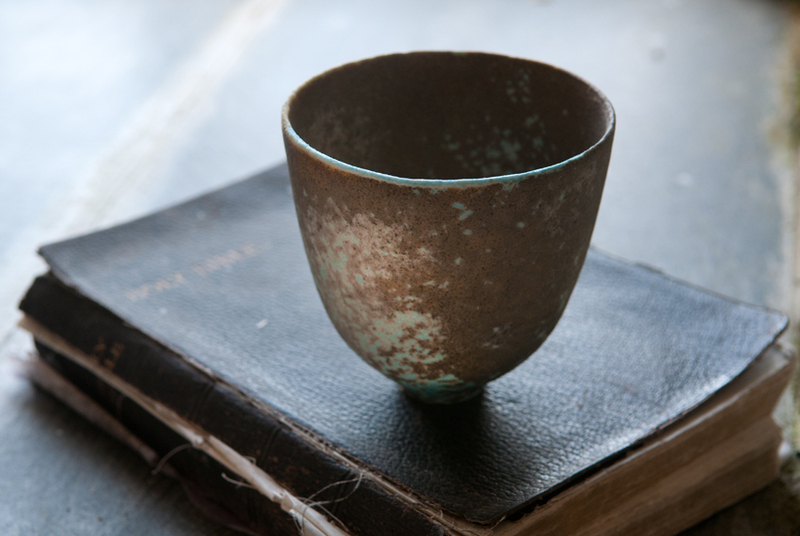 As such, it is truly a place of historic importance to the development of 20th Century studio pottery. Who knows where future discussions around that same fireplace will lead us….. The Leach Pottery fire will finally be relit as part of a celebratory gathering on Friday 24th October, and we will be there to show our support. Watch this space for news and photos from the event. Steve Urwin on Going, Goats, Gone.